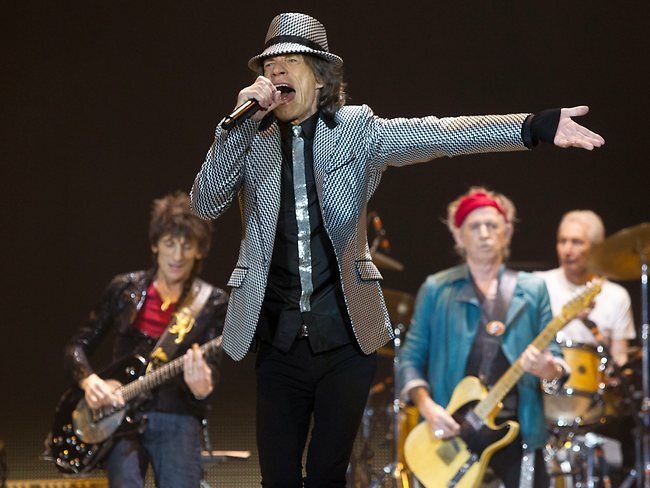 The Rolling Stones returned to the London stage on Sunday night in the first of five concerts to celebrate their 50th anniversary. Mick Jagger, Keith Richards, Charlie Watts and Ronnie Wood were joined by their original bass player Bill Wyman at the 02 Arena. Music critics hailed the rockers’ return a success. Reviews of the gig described the band as “still leading the pack” and “at the cutting edge of pop”. “They have a combined age of 273, but the four Stones remain an extraordinary live proposition,” John Aizlewood wrote in the Evening Standard. “Jagger, camp and louche, was a preening but energetic peacock; Richards was as cool as a man sporting a red hairband and turquoise jacket could possibly be; Ronnie Wood was a chirpy mascot and that ocean of serenity Charlie Watts showed the tiniest of drumkits can make the biggest noise,” he said. Guest stars included Mick Taylor – was originally in the Stones from 1969 to 1974 – who played lead guitar on Midnight Rambler. Mary J. Blige also duetted with Sir Mick Jagger on Give Me Shelter. “It’s amazing that we’re still doing this, and it’s amazing that you’re still buying our records and coming to our shows,” the frontman said. Mick Jagger also joked about the controversial price of the concert’s tickets. “How are you doing up in the cheap seats?” he asked fans in the upper rows. The show began with a brief video tribute from stars including Sir Elton John, Iggy Pop and Johnny Depp. The band played 23 songs including some of their rarely-played early numbers such as It’s All Over Now and their cover version of the Beatles’ I Wanna Be Your Man. They also showed a video montage of their big influences such as Muddy Waters, Bob Dylan and Johnny Cash. The Independent described Sir Mick Jagger as being “in good voice” and “impressively strident” in the opening song. Reviewer Andy Gill was also positive about the guest appearances of Wyman, who he described as “stolid as ever” on It’s Only Rock’n’Roll and Honky Tonk Women, and Mick Taylor, whose “stinging lead lines” on Midnight Rambler combined well with the rest of the band. “For seven minutes or so, the years fall away and it seems as if the group were still at the cutting edge of pop – something their two new numbers, sadly, never quite manage,” he said. Writing in The Guardian, Alexis Petridis said the show was “liberally flecked with moments” which were “about more than mere nostalgia, where the band seems to suddenly hit its stride, when well-worn material comes alive”. “Keith Richards’ Before They Make Me Run arrives with its screw-you swagger intact,” he added. The band also played classics such as Paint It Black and Jumping Jack Flash, but they didn’t get to perform Satisfaction as they ran out of time. Still, fans were happy with the performance. “It was pretty special. It’s not very often you get to see something like that. It was incredible,” said one. Another man who travelled from Australia for the concert said it was “amazing”. “Mick Taylor… What a genius,” he added. Music critic Neil McCormick said the music sounded as good as it did when he first started going to gigs in the early 1980s. “They really did seem happy to be there,” he said. The series of gigs marks 50 years since the band first appeared in a small London club determined to pay homage to the masters of American blues. There will be one more concert in London on Thursday, followed by one in Brooklyn, New York, and two in Newark, New Jersey.